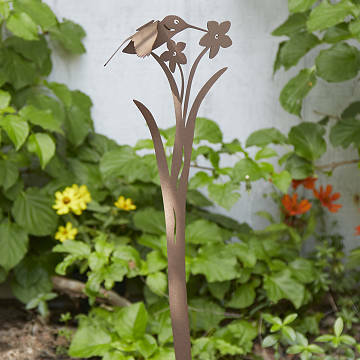 This kinetic steel garden stake reflects the joy of seeing a hummingbird in flight. Handmade by bird-loving metal artists Randy and Holly Smithey, this kinetic garden stake reflects the joy of seeing a hummingbird in flight. Each hand-formed recycled steel sculpture captures the unique silhouette and hovering motion of the tiny garden visitor. With just a gentle breeze, the balanced wings will move and mimic the motion of the bird as it hovers near a flower (although at a slower rate). It's a great gift for any bird lover's garden or yard. Handmade in Bend, Oregon. I always find the "different" item for gifts or special events at Uncommon Goods. Product is easy to assemble. Great addition to my garden. I liked it and it looked like the picture except the hummingbird wings seemed a little big compared to the hummingbird. They don't really move much in the wind either. It is in a very large flower pot but may get moved into the garden later in the summer. My sister-in-law loved the idea of it when she opened the box. This was a gift for my mom for Christmas. She loves the spring time when the hummingbirds are out. At times she gets over 15 birds and to listen to the sounds they make when the feed is peaceful. I look out my office window at home and have become addicted to Hummingbirds. When the Grandkids come over they love to watch for them too. So I will be placing this so I can see it flutter out my window.